Anthony Cornelius Hamilton (born January 28, 1971, Charlotte, North Carolina.) is an American R&B singer-songwriter, and record producer who rose to fame with his platinum-selling second studio album Comin' from Where I'm From (2003), which featured the title track single "Comin' from Where I'm From" and the follow-up "Charlene". 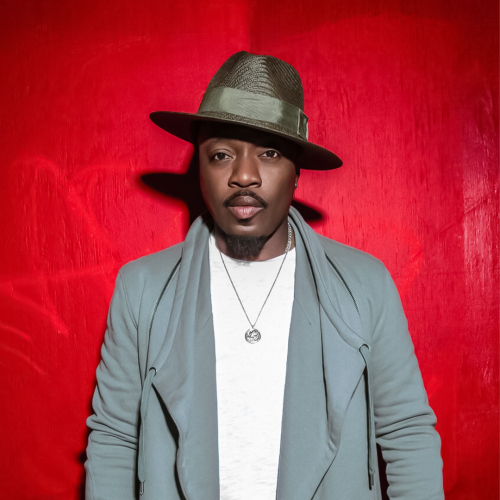 His international fame came through "Freedom" from the soundtrack album of Django Unchained cowritten and sung as a duo with indie soul singer Elayna Boynton. Career: Hamilton started singing in his church's choir at age ten. He attended South Mecklenburg High School where he sang in their award winning choir under the direction of Mark Setzer. In 1993, he left Charlotte and headed to New York City, where he signed with Andre Harrell's Uptown Records. In 2000, he joined soul singer D'Angelo's international tour in promotion of the Voodoo album, on which he was a backup singer. Nappy Roots: Hamilton was first introduced to mainstream audiences with his singing of the chorus of Nappy Roots 2002 single "Po' Folks" which earned a Grammy Award nomination for "Best Rap/Sung Collaboration" in 2003. "Po' Folks" is the second single from the multi-platinum Watermelon, Chicken & Gritz album. Hamilton followed up with three collaborations on Nappy Roots next Atlantic Records release Wooden Leather with "Sick & Tired", "Push On", "Organic" and then one feature on The Humdinger on the single "Down N' Out". Nappy Roots and Anthony Hamilton also have a song together called "Bluegrass Stain'd" with Mark Ronson that was released through Elektra Records. 2004 to present: Hamilton was featured on Jadakiss' 2004 hit "Why" (which was also nominated for "Best Rap/Song Collaboration", in 2005) and two of 2Pac's remixed songs. Hamilton also contributed to 2002's "Thugz Mansion" (7" remix) and 2006's "Dear Mama" (Frank Nitty Remix). Hamilton's first compilation album, Soulife, was composed of songs recorded during the early part of his career. These previous works were released in June 2005. Ain't Nobody Worryin', his gold-selling third studio album, was released on December 13, 2005. Hamilton was featured on a track from The RH Factor's 2003 album Hard Groove called "Kwah/Home". He also appeared on Angie Stone's "Stay For A While" in 2004. He also made a guest appearance on blues singer-guitarist Buddy Guy's 2005 album Bring 'Em In, contributing vocals to a cover of Bob Dylan's 1969 "Lay Lady Lay," which also featured Robert Randolph. At the 2006 BET Awards, Hamilton won the BET J "Cool Like That" Award. Comedian Dave Chapelle had Hamilton as a musical guest on his show Chappelle's Show in episode 6, Season 2 that premiered on Comedy Central. He also made a guest appearance on the UPN show All of Us in Season 2. Hamilton made a cameo as a soul singer in the film American Gangster, to whose soundtrack he also contributed. During the 2008 BET Awards, Hamilton performed Al Green's "Tired of Being Alone" during a tribute to Green's career. Later in 2008, he was featured on The Recession the certified Gold selling album by Young Jeezy. 2012 found Hamilton on two successful Def Jam releases: Big K.R.I.T. 's Live from the Underground and Life Is Good by Nas, which debuted at #1 on Billboard 200. Later on in 2012 Hamilton was featured on the soundtrack to Quentin Tarantino's Django Unchained in the track "Freedom" in a duo with indie soul singer Elayna Boynton. Personal life: On November 2, 2010, Hamilton and his wife Tarsha welcomed twin boys. He is also the father of Anthony (22), Romeiro (20), and Tristen (15). On his official Facebook page on June 11, 2012, Hamilton announced the birth of another son, Princeton Harris Hamilton.